Organizations are coming to the reality that work-life balance is no longer solely an issue for working women. As we progress further into the 21st century, workers and ways of working are changing. We have four generations operating together in the workplace, and a tremendous variety of professional expectations, values, goals, and needs. People want to work, but more and more need work to work better in their lives. For some, it might be a question of flexibility to care for family, for others, a question of personal fulfillment and being present both at work and at home. Regardless, people are expressing the need for an improved sense of work-life balance. It has become central to maintaining a diverse and inclusive workplace. As companies grapple with increased talent and marketplace competition, work-life balance has become a pivotal issue for higher engagement, increased productivity, greater innovation, and employee retention. 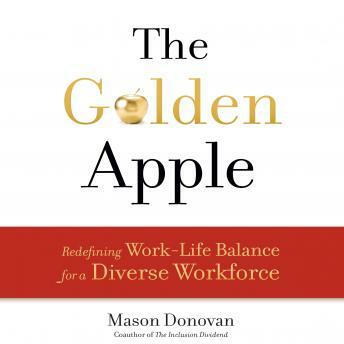 Backed by 20 years of talent engagement expertise, The Golden Apple bridges the gap between awareness and action, giving leaders practical solutions they can take for immediate impact: the 50-minute meeting, mindful minutes, and establishing clear boundaries that can instantly provide a valuable return with minimal effort. In short, the book shows how full engagement of a diverse, inclusive workforce is the competitive advantage of our time.